With the amount of “product” many of us own and use on a regular basis, our bathrooms can often resemble a beauty salon rather than an integral part of our home, with items scattered about on every available surface. Whilst this may help us look our best, the same can’t be said for your poor old, unloved bathroom. Luckily, help is at hand. Bathroom furniture is fast becoming one of the most popular items when people search for bathrooms. Not least because, with an increasing pressure on space in our ever-shrinking homes, we find it difficult to use space effectively. Sometimes, it is simple to add an item of furniture to increase your storage space, or, when planning an entire bathroom, it makes much more sense to incorporate furniture into your layout. 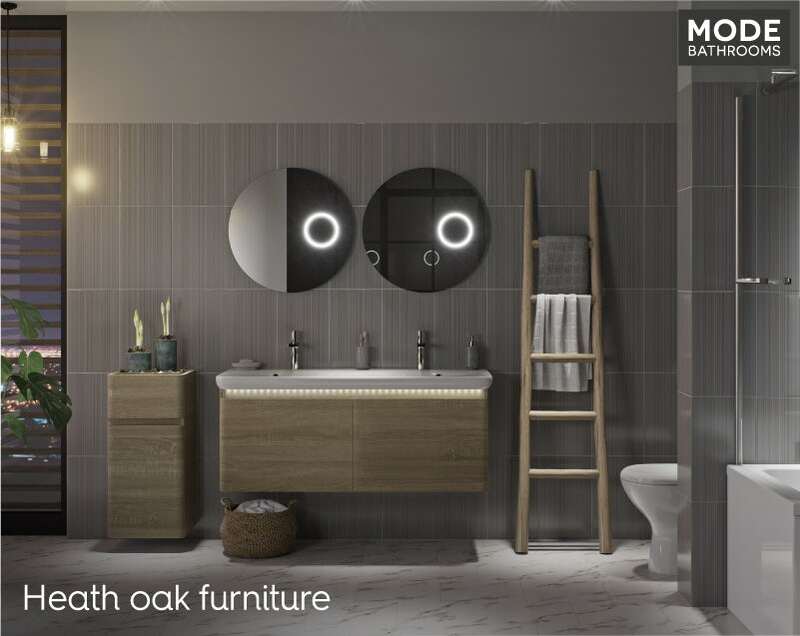 In this article, I’ll show you some of the new and innovative bathroom furniture available from VictoriaPlum.com, which will help solve all your space issues in 2019. Why should your kitchen have all the fun when it comes to fitted furniture? It may not be something you’ve ever considered but fitted bathroom furniture could be the answer to all your problems in 2019. 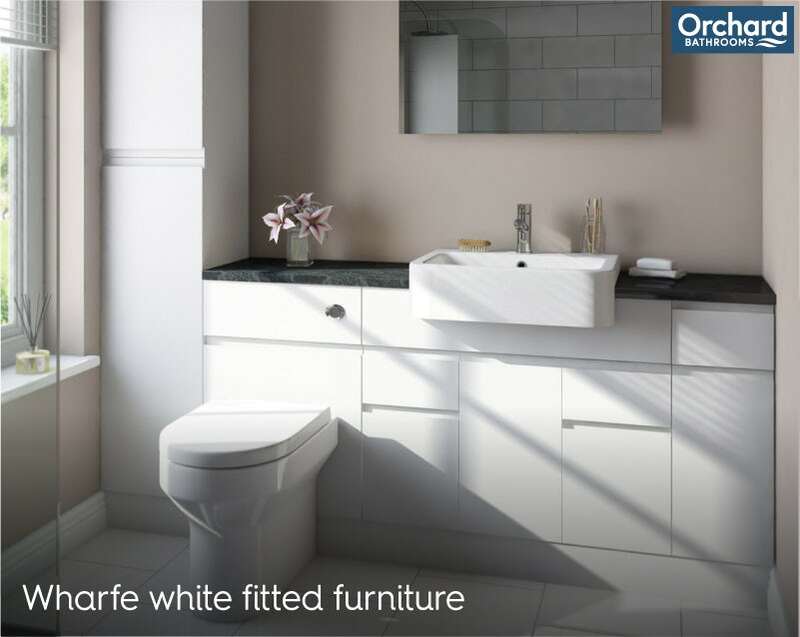 Featuring a durable moisture-resistant engineered wood construction with a white gloss finish that is easy to clean, plus a modern recessed handle design for sleek, contemporary styling, this furniture range from Orchard Bathrooms is ideal, especially if you're building your bathroom on a budget. New to our product range, there is a selection of units to suit your space, complete with soft close doors and drawers, giving you plenty of options. The units come with adjustable plastic feet to allow for uneven floors. Choose individual units to match your space, add your plinth and choose from a selection of 3 stylish, FIRA (Furniture Industry Research Association) approved laminate worktops (midnight black, snow white and taurus beige) for the perfect look. You can even buy one of the complete suites available, removing the need to mix and match. 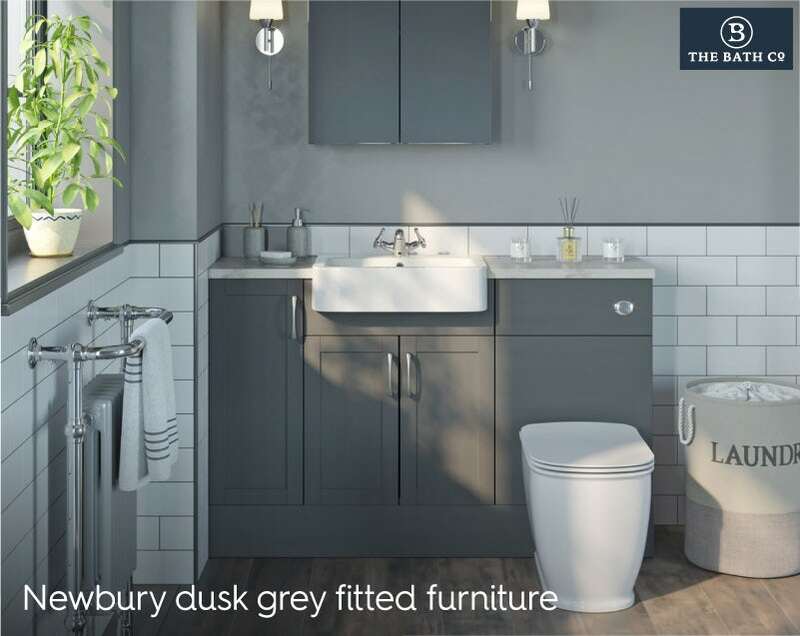 Available in your choice of crisp white or on-trend dusk grey, the Newbury fitted furniture range is also new to our collection. Exclusive to The Bath Co., this traditional style furniture range will allow you to make the most of your space, whilst creating an elegant vintage-inspired design. Made from engineered wood that has been treated for protection from moisture, this furniture range comes with a beautiful wood grain finish. Soft close doors and drawers feature easy-to-grip handles for quick access. As with the Wharfe fitted furniture, creating your dream bathroom and making optimum use of space is easy. Either select the exact units you need or buy a complete suite. Choose from white claystone, beige granite or ferro grey laminate worktops. You can even purchase matching bath panels for a fully coordinated look. It’s elegant, quick and simple to do. Why not consider fitted bathroom furniture for your 2019 bathroom project? When searching for bathroom furniture ideas, have you ever been tempted by colours other than some of the more neutral (and dare we say it, boring!) tones that are currently available? Well, one of the most popular colours for 2019 is blue. 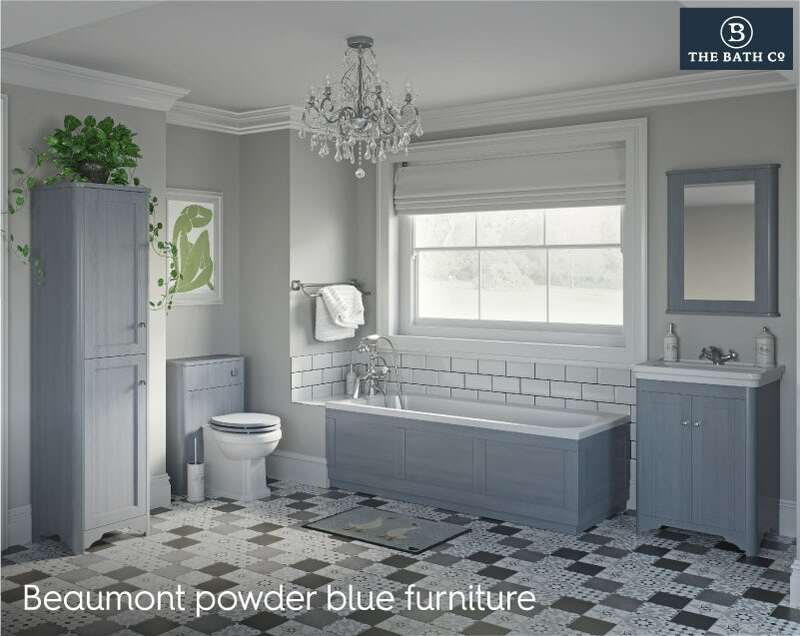 Blue has always been a good choice for bathrooms, not least when creating a coastal bathroom, and, after extensive customer feedback, we've finally launched our first blue bathroom furniture ranges. 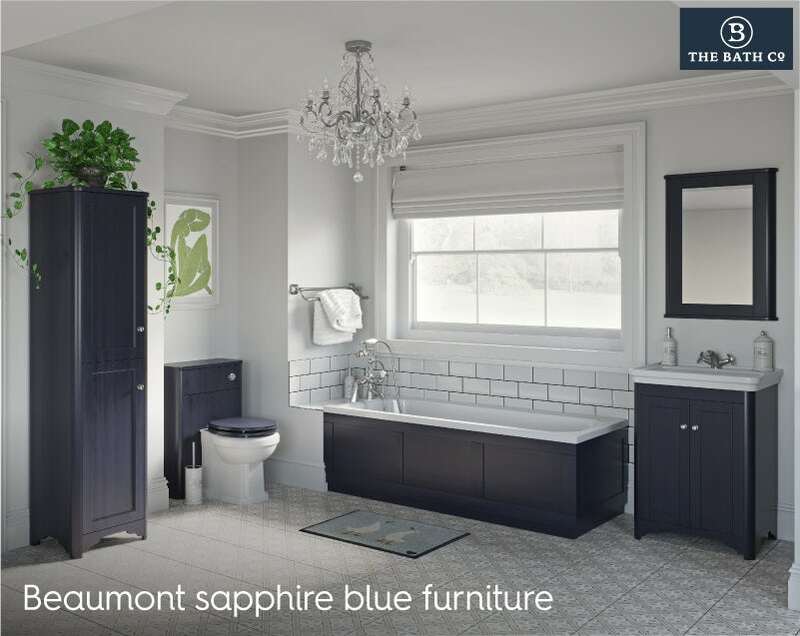 Available in deep sapphire or soft powder blue, these beautiful bathroom collections from The Bath Co. are a great way to add classic style and storage to your space. With all the traditional detailing you’d expect from a luxury furniture range, the Beaumont range features a gorgeous woodgrain finish with a hardwearing moisture-resistant engineered wood construction. Soft close doors and drawers, coupled with rounded corners, brushed nickel handles and panel detailing make this range an instant classic. You can simply refresh your existing bathroom or kit out a full refurbishment with your choice of units, including a vanity unit, tall unit, back to wall toilet unit, plus matching mirror, toilet seat and bath panels. Why not pair with taps and a suite from the Beaumont collection and create an Art Deco style bathroom? 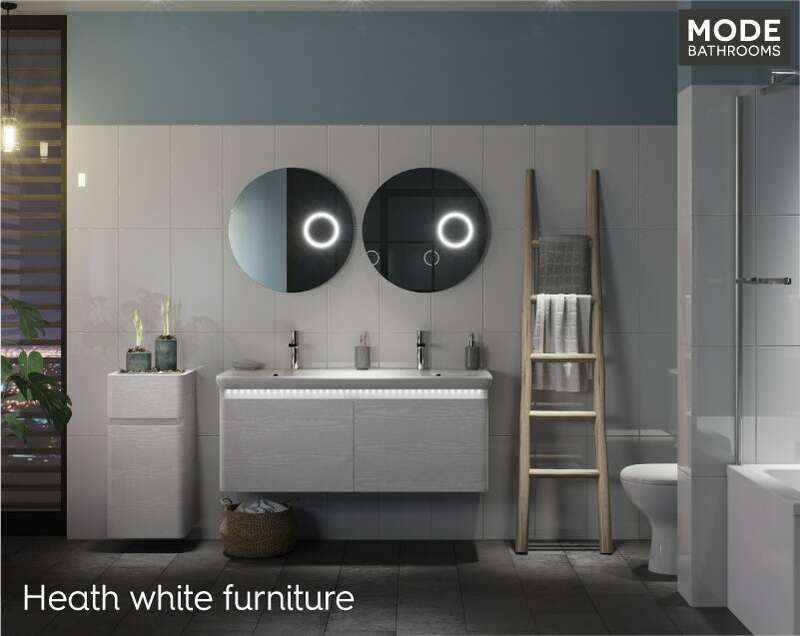 This designer furniture range comes with all the premium features you'd expect from Mode Bathrooms, including soft closing drawers with durable metal runners, glass drawer dividers for effective and efficient storage, plus a high quality resin basin with smooth bowl design. For added peace of mind, all vanity units are fully tested to meet CE and UK standards. As you may have seen, if you viewed our Manhattan style bathroom, mid-century styling is making big-inroads into interior design this year. If you want to add a touch of modernism into your bathroom design, there are some great options to choose from. 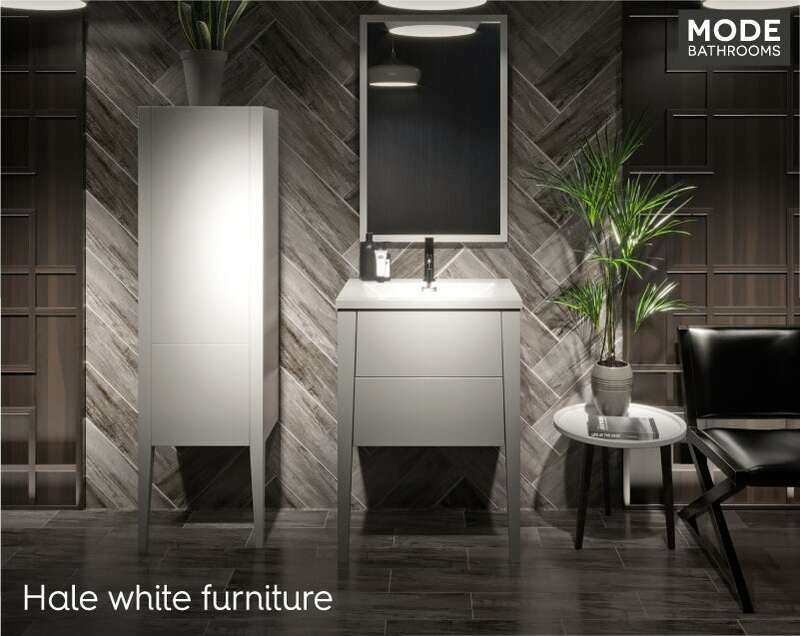 From Mode Bathrooms, this range is available in your choice of gloss white or matt greystone. The semi wall hung design with slender legs give a nod to modern designs from the middle of the 20th century, whilst looking sleek and effortlessly contemporary. What’s more, you can also create less fuss and arguments on those busy mornings with double vanity unit options. Featuring an undercounter basin or countertop basin, plus push-to-open drawers, Hale furniture is an incredibly stylish choice. Tapered shapes combine to create a beautiful and versatile look that's suitable for a wide range of bathroom styles. If you're looking for a simple update to your traditional bathroom or even renovating a period property, why not consider something that is in-keeping with your overall theme? 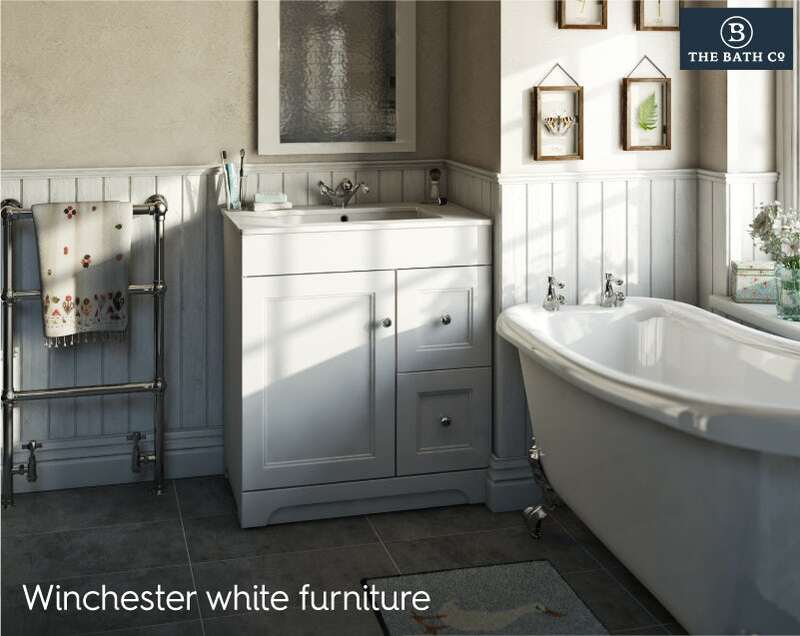 Part of the Winchester furniture collection from The Bath Co., this is a luxury furniture range, complete with a beautiful gloss finish and glass handles for that extra-special finishing touch which you’ll definitely appreciate. 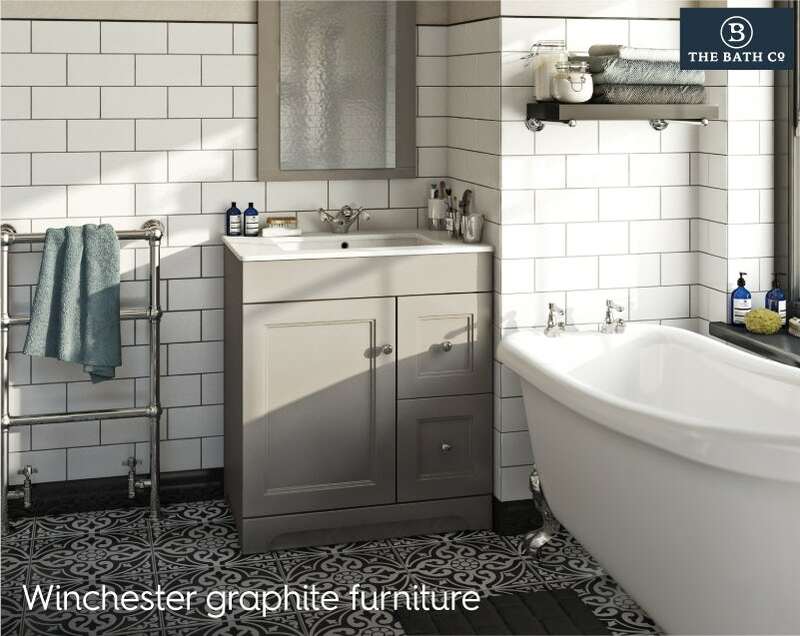 Built using moisture-resistant engineered wood for long-lasting use, the Winchester range is available in your choice of graphite or white. Perfect for an easy bathroom update, the vanity unit comes with an elegant undercounter basin made from hardwearing resin. Plus, to make your plumber’s life a lot easier, an inset is provided at the rear for pipework. Check out our bathroom ideas for 2019 for more inspiration. When you buy furniture from VictoriaPlum.com, we don’t expect you to deal with fiddly flatpacks. All our bathroom furniture is supplied pre-assembled, making installation much, much easier. 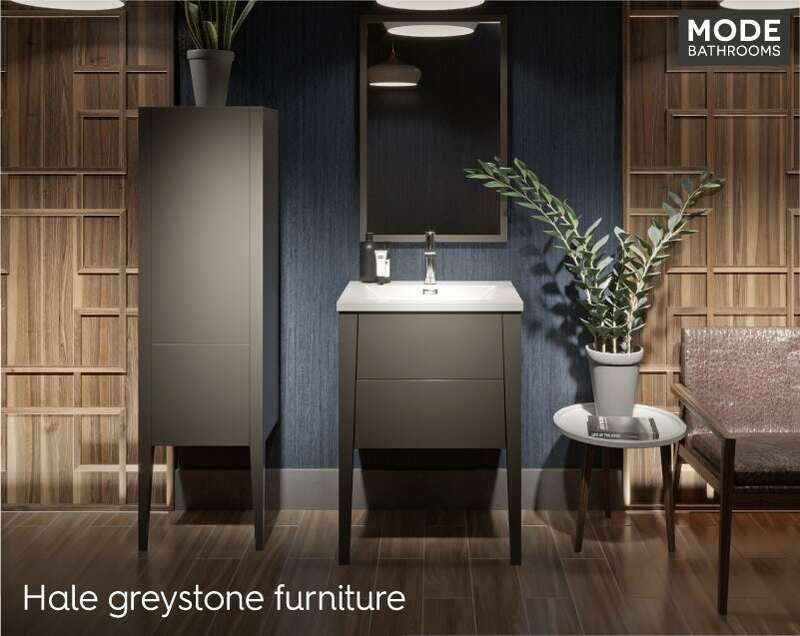 Browse our comprehensive selection of bathroom furniture today.